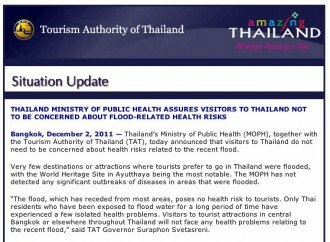 Bangkok, December 2, 2011 —Thailand’s Ministry of Public Health (MOPH), together with the Tourism Authority of Thailand (TAT), today announced that visitors to Thailand do not need to be concerned about health risks related to the recent flood. Very few destinations or attractions where tourists prefer to go in Thailand were flooded, with the World Heritage Site in Ayutthaya being the most notable. The MOPH has not detected any significant outbreaks of diseases in areas that were flooded. “The flood, which has receded from most areas, poses no health risk to tourists. Only Thai residents who have been exposed to flood water for a long period of time have experienced a few isolated health problems. Visitors to tourist attractions in central Bangkok or elsewhere throughout Thailand will not face any health problems relating to the recent flood,” said TAT Governor Suraphon Svetasreni. Throughout the flood, the MOPH has advised residents about minimizing related health risks. Its surveillance and rapid response teams (SRRT) conducted ongoing inspections and implemented comprehensive disease control measures. The MOPH also established a Joint Technical Advisory Group (JTAG) in co-operation with the World Health Organization and the United States Centre for Disease Control to implement a strategy of preventing and controlling flood-related diseases. So far, the SRRT has only detected sporadic cases and small clusters of food poisoning and acute respiratory infections related to the flood. None of the cases involved tourists. There have been no outbreaks of flood-related diseases, and none are anticipated as conditions steadily improve. The MOPH also has an inspection team focused on ensuring sanitation at tourist attractions and destinations that were affected by the flood, especially in terms of food and water safety as well as hotel and lodging standards. 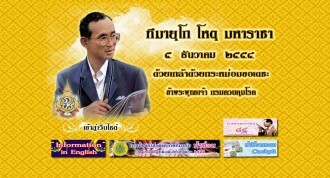 According to the MOPH, visitors to Thailand are at no higher health risk than travelling here at any other time. They only have to take the normal precautions for visiting any tropical country. This entry was posted in Blogbuch and tagged Flood, Flut, Gefährdung, Gesundheit, Gesundheitsministerium, Gesundheitsprobleme, health risks, Internetseite, keine Gefährdung, MOPH, Pressemitteilung Thailändisches Fremdenverkehrsamt, Public Health, TAT, Thailand, THAILAND MINISTRY OF PUBLIC HEALTH, Thailands, Tourism Authority of Thailand, Tourismus. Bookmark the permalink.